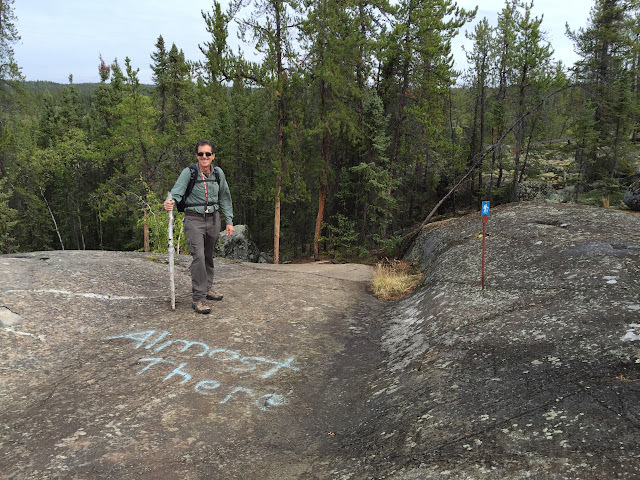 Seeking True North, Day 10: Yellowknife, NWT, to Ottawa, ON. While posting clues this morning for the letterbox we planted at the falls yesterday, we realized that we did not visit Cameron Falls, the well-known Ingraham Trail attraction, after all. Cameron River Ramparts is a different cascade. After stumbling on this bit of information, we decided to take advantage of having a late afternoon flight to Ottawa and return to the Ingraham to search out "the real" Cameron Falls, which turned out to be a tiger to yesterday's pussycat. Almost hidden by the foliage it landed in, the car must have taken flight. 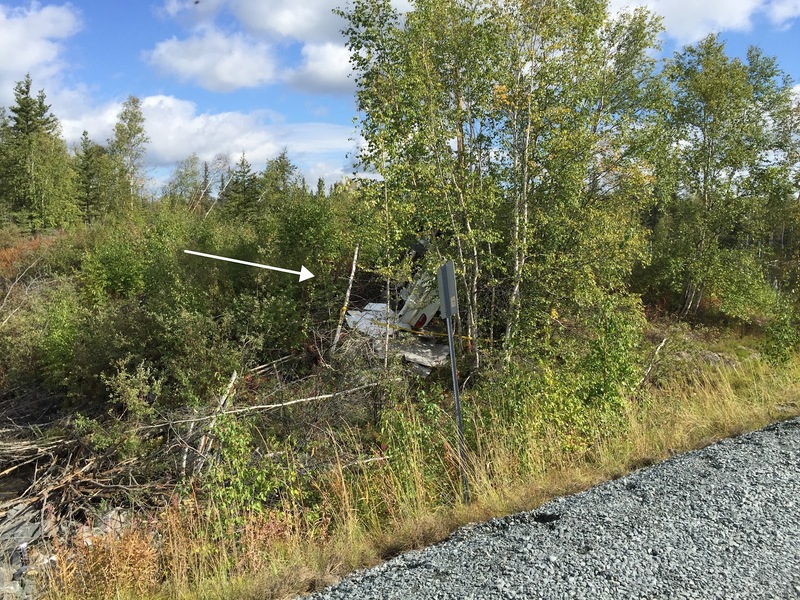 A few kilometers along the road, we noticed that since we were there yesterday a car had managed to fly off the road, cross a creek, and land on the passenger side 50 feet off the road amidst a stand of birch saplings. What happened to the driver we were unable to determine, but we wondered whether the freshly oiled chip seal surface fueled his flight. 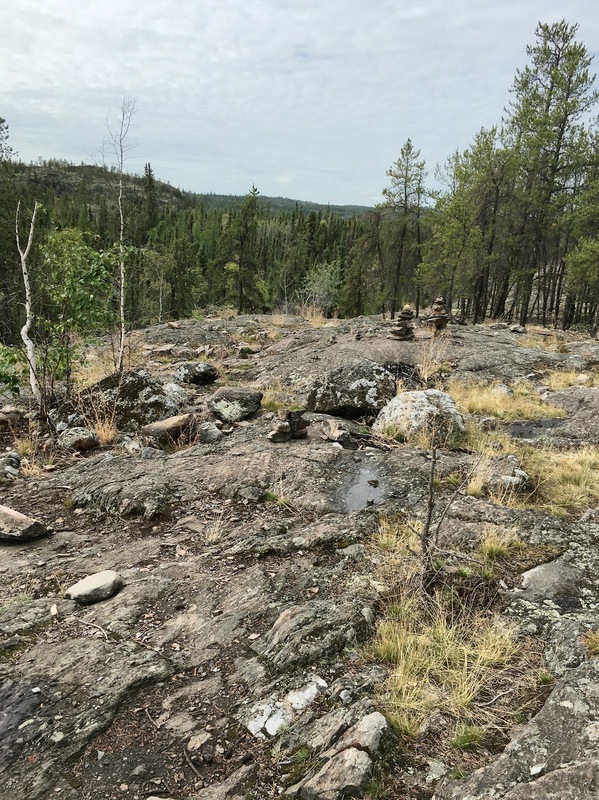 Unlike so many roads in sparsely populated areas, the Ingraham does not have the company of a power line running alongside it. 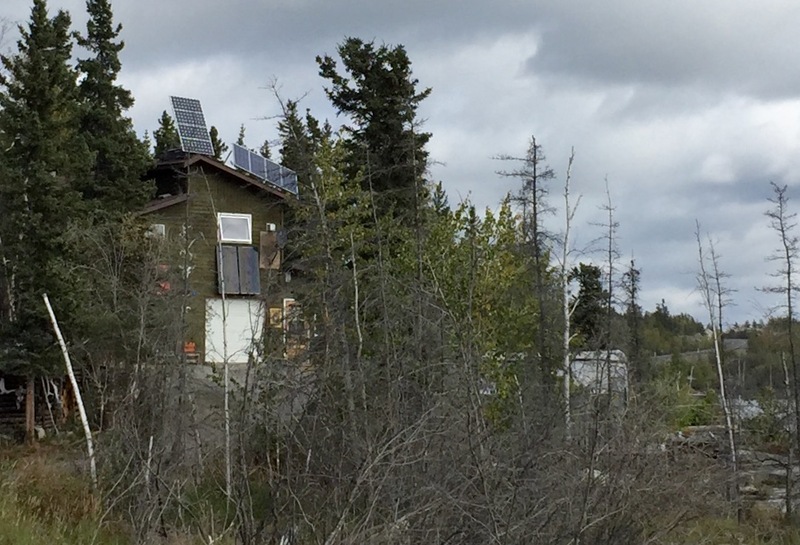 The few isolated homes along the road are equipped with hefty solar panels to pull in their energy from the sun. Many also sport TV satellite dish receivers, so presumably, Sol is filling the bill—without sending a bill. 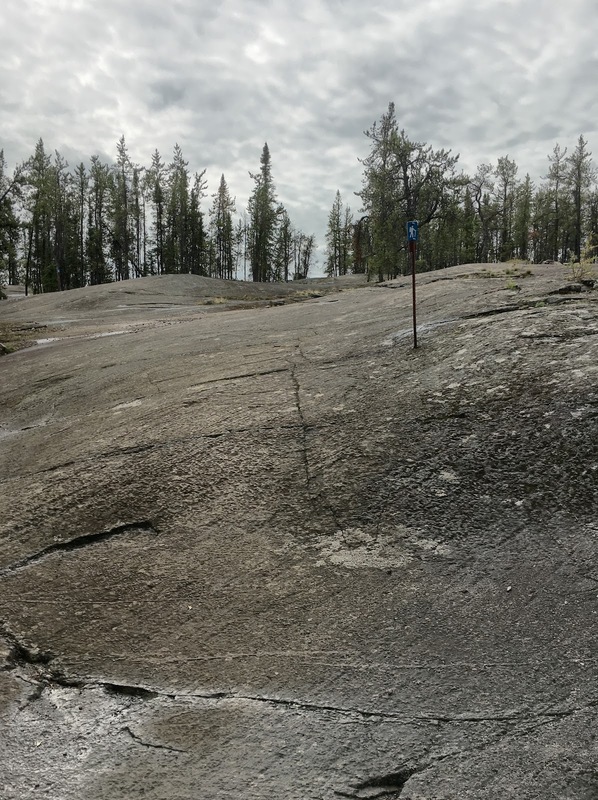 When we reached the sign for Hidden Lake Territorial Park near the 46 km marker, we realized how we missed the trailhead yesterday. 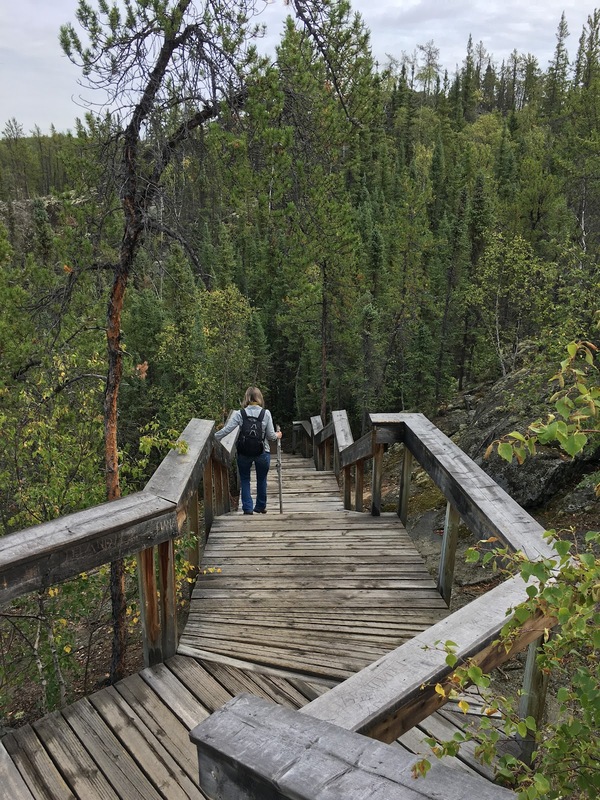 "Cameron Falls Trail" appeared in very small type below the park's name. 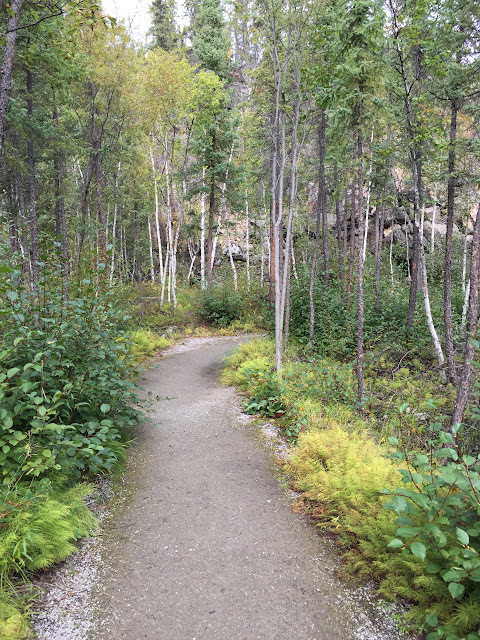 Having read that the three-quarter mile hike to the falls should take about 20 minutes, we figured we had plenty of time to do the hike and get back to Yellowknife for a late lunch before our 5 p.m. flight to Ottawa. Wishing I had the hiking stick I found at the other falls trail yesterday, we set out eagerly just before 1 p.m. Mosquitoes assailed us the moment we left the car, but this time we were better prepared, and they were no match for Deep Woods Off. The trail started out gently, winding through a lush stand of trembling aspen, spruce and jack pine. Soon I came upon a broken-off dead aspen that leapt to my hand when I wrenched it, eager to support me along the way. As we progressed, mild slopes gave way to steep stairs and then to scrambles over boulder fields and rock faces left in their natural state. 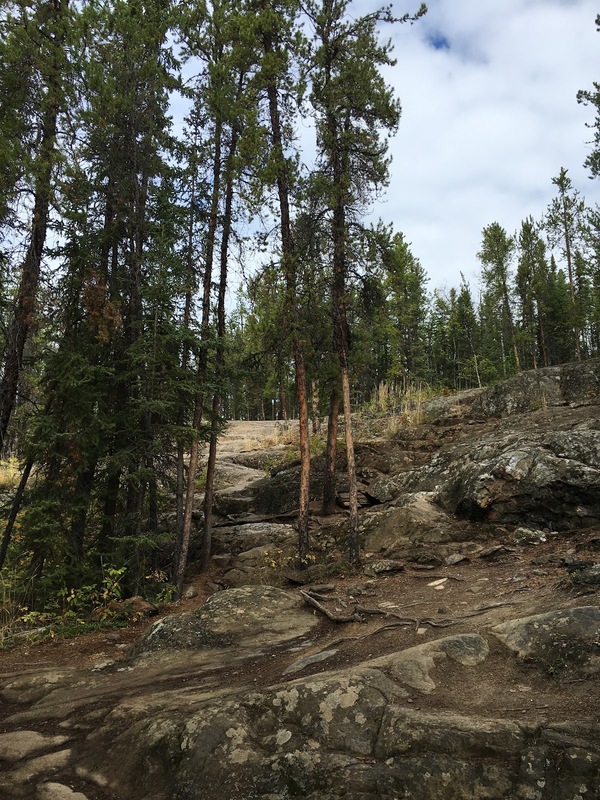 Creeping my way up a damp, steep face of granite, I tried to squelch memories of fracturing my kneecap in a sprawling fall on a perfectly level driveway eight years ago. About seven tenths of a mile in, we reached a high point where we could finally hear the sound of rushing water. Indeed, a bit of graffiti ahead encouraged us to believe we were "almost there." 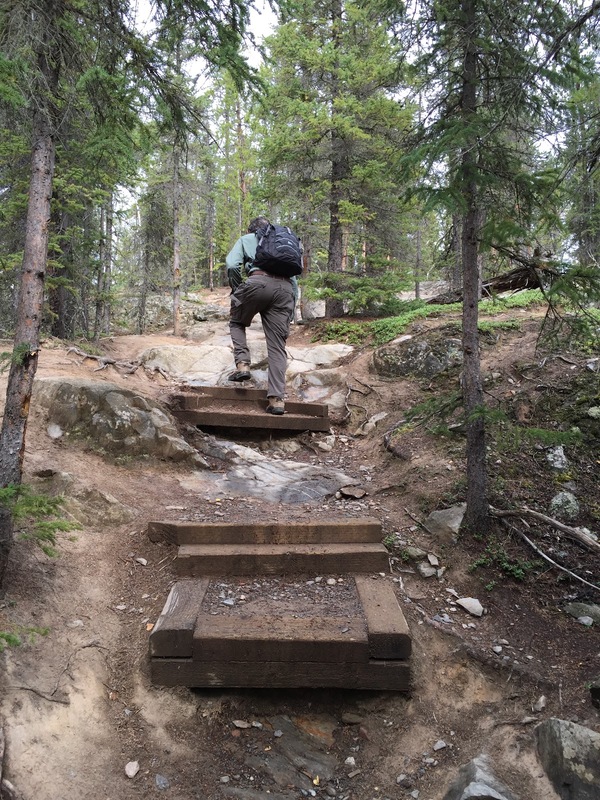 Pressing on, we continued down several flights of steps and on to more rock scrambling until we reached the bottom of a particularly steep section that was bare rock. By then, the sound of the falls was out of earshot, so we had lost faith with the hot pants graffiti artist. Time was closing in on 2 p.m., and we wanted to preserve time for one more lunch at NWT Brewery's Woodyard before leaving Yellowknife. So we aborted the hike, later calculating that at the 0.8 mile point, where we turned back, we were only about two-thirds of the way to the falls. 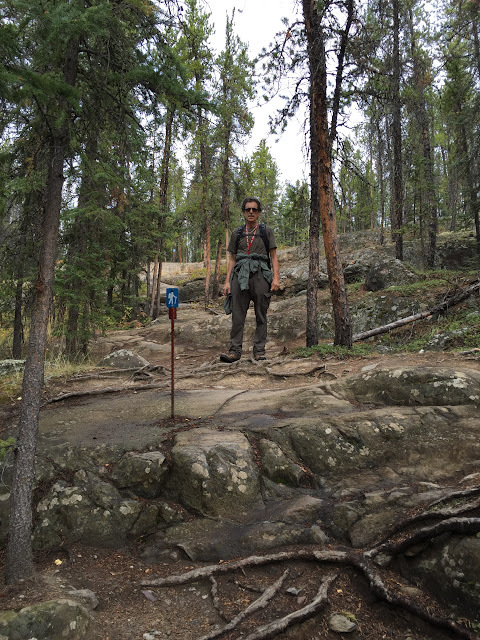 Apparently what we believed was a 1.2 km hike was actually 1.2 miles. Tough miles. Back down the Ingraham Trail, we returned to Yellowknife and, for the third consecutive day, made a pilgrimage to the Woodyard for lunch. Though we had both loved their amazing house salad—shaved apples, feta cheese, candied pecans and dried cranberries on a bed of fresh mixed greens—I decided to try the veggie burger I had been eyeing on the menu. Oh, what a great decision it was. It turned out to be one of those extraordinarily rare OMG dishes that knock your socks off with the first bite. Could anything really have such a rich, full, exquisite flavor? I don't usually get excited about food, but I wanted to stretch this meal out for the rest of the day to continue savoring every morsel. 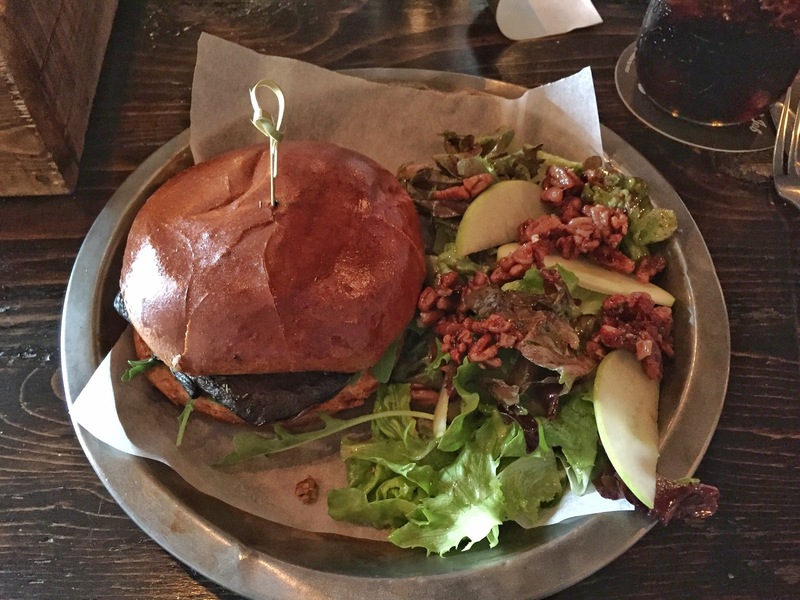 The menu describes it as "portobello mushroom, goats cheese, arugula, onion jam, spicy aioli on a toasted brioche bun." For me, "heaven on a plate" was more accurate. As we left the restaurant, we stopped by the kitchen to pay homage to the guys who prepared this dish so masterfully. This 'bello burger may be just the thing to draw me back to Yellowknife when it's 40 below zero. 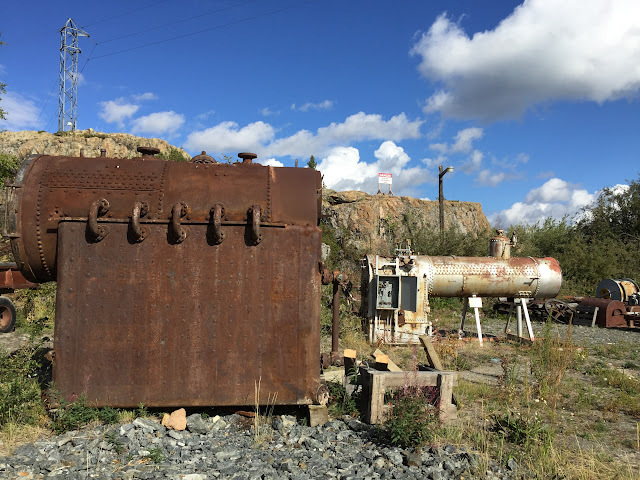 On our way to the airport, we detoured by the remediation project/developing mining museum at the old Giant Mine near the town dump. 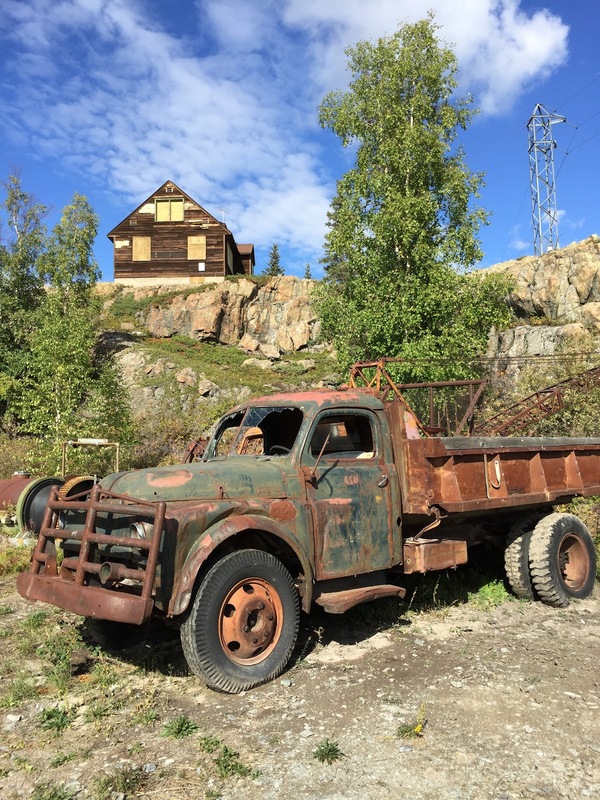 Ore cars and rail tracks, drilling equipment and loading machinery from the mine's gold mining boom days sit in various states of rust and decay in an outdoor "exhibit." Another quirky Yellowknife attraction, it offered a window onto the town's industrial past. We reached the airport about the same time our aircraft was arriving from Whitehorse. 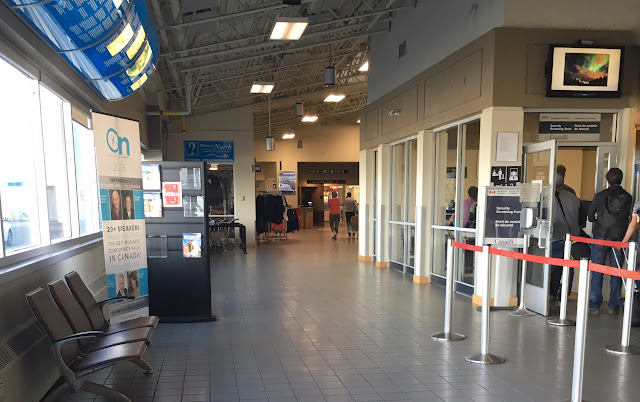 Again relishing the informality and short lines in these cozy five-gate airports, we sped through the security checkpoint in short order and soon boarded our four-hour flight to Ottawa with Air North, the Yukon's airline headquartered in Whitehorse. 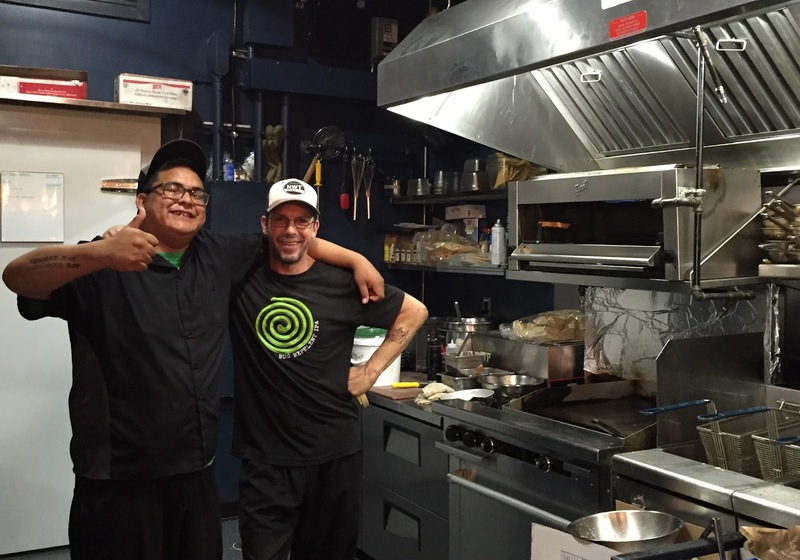 As in our previous experience, service was exceptional and the food surprisingly flavorful. Yes, they feed everyone, unlike U.S. airlines. One of the flight attendants picked up my name from my ticket as I boarded and remembered it, calling me by name at each interaction. A very nice touch. Arrival at Ottawa's major international airport was quite different. The greatly increased distance from our gate to baggage claim was reflected in the time we had to wait before our bags popped up onto the conveyor belt. Though he was grudgingly polite, our taxi driver was not happy to be taking us to the nearby Hilton Garden Inn. "It's in walking distance," he claimed. Sure, if you want to walk a mile and a half across a busy highway after midnight carrying your luggage. Ultimately, he ended up with a generous tip and responded with a pleasant change of attitude. Tomorrow we'll fly to Iqaluit, the capital of Nunavut, where the high temperature should be in the forties. Hooray! - Bossy toddlers on flight: 0!! Yikes. We forgot our climbing gear.